Maggie McDonald has a penchant for order that isn't confined to her clients' closets, kitchens, and sock drawers. As she lays out her plan to transfer her family to the hundred-year-old house her husband, Max, has inherited in the hills above Silicon Valley, she has every expectation for their new life to fall neatly into place. But as the family bounces up the driveway of their new home, she's shocked to discover the house's dilapidated condition. When her husband finds the caretaker face-down in their new basement, it's the detectives who end up moving in. What a mess! 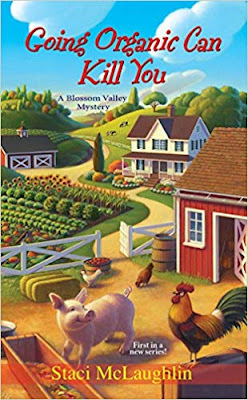 While the investigation unravels and the family camps out in a barn, a killer remains at large-exactly the sort of loose end Maggie can't help but clean up . . .
Maggie McDonald, her husband Max and their two sons, David and Brian have just moved from Stockton, California to Orchard View, near Silicon Valley. While they are barely inside the door of the house, which was left to Max by his Aunt Kay, he stumbles across a body in the basement. There's nothing for it but to spend a night or two in the barn (which, thankfully, has a bathroom and shower) while the police decide if it was natural causes. But the house needs a lot of work until it's completely habitable, and before they can really settle in, Max is sent to India for his job, leaving Maggie and the boys to set things in order. It's not too long before there's an act of vandalism on the property, and the police figure it's just kids and probably won't escalate. Maggie, a professional organizer, is slightly daunted by all that lay before her, since it seems the house needs everything from the ground up - including appliances - but soon receives help from a woman she meets at a parents' meeting at her sons' school. 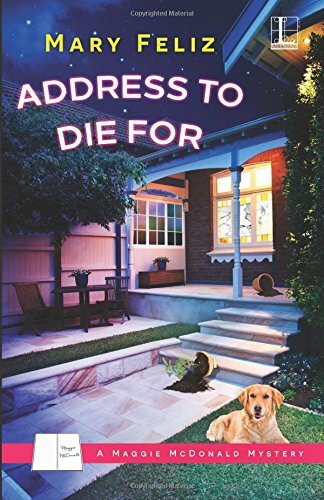 The friend, Tess, is a realtor, and knows nearly everyone in town, so getting the house cleaned and in order doesn't seem to be a problem - until there's another act of vandalism, and it seems to be escalating in violence. But when another death occurs, it's not just Maggie who thinks the vandalism and the death could be connected, and finds herself dragged into an investigation of what's going on, whether she wants it or not. Wanting to protect her children at all costs, and thinking that her family and her very home is in danger, Maggie ignores the warnings to 'go back to Stockton,' determined to figure out who is trying to get rid of them - and why. Otherwise, I enjoyed the book for the most part, with the mystery well hidden until almost the end of the book, which is how it should be. There were plenty of misleading clues, lots of suspects and questions that never really seemed to get answered, which showed Maggie's frustration in trying to figure everything out. This is a very good thing. But in the end I felt that at the conclusion of it all, the police should have been more aware of what was going on. If the 'problem' as it were, was as widespread as we were told at the finish, you would think that the local authorities would have somehow been aware of something like that occurring. It seemed plenty of other people knew what was going on (including kids) but not them. Where I live, they would have been all over it. Yet they admitted that they were completely unaware of it, which seemed unrealistic to me. However, since this is a first book, I imagine the author is still finding her way, and because of that, it was otherwise a good read and a good start to a new series. Recommended. Penelope's life revolves around cooking and keeping her Red Carpet Catering business afloat, and she's just landed a hearty new job for her and her staff. Just when Penelope thinks life couldn't be sweeter, a panicked late-night phone call from Max, her best friend's brother, ends abruptly with shots fired on his end. The next morning, a handsome model and club promoter turns up dead, and when the police serve up Max as their main suspect, Penelope risks it all to prove his innocence (and find him before the police do). With her relationship as sturdy as a soup sandwich and her own life being threatened, it's up to Penelope to find the truth before anyone else is eighty-sixed. Penelope Sutherland is a caterer for the film industry, and at present is in New York City because her friend Sienna Wentworth has a fashion line premiering. After attending the show, her detective boyfriend Joey Taglioni has a surprise for her - he's booked a room at the Tribeca Loft hotel, and has plans for them to spend a few days sightseeing. But early the next morning around three Penelope receives an unsettling telephone call which from her friend Max which leaves her reeling. Max is the brother of Penelope's best friend and housemate, actress Arlena Madison. He is a celebrity in his own right, being on a reality television series, but surprised them the evening before as one of the models in Siena's fashion show. When the phone call is abruptly terminated, Penelope calls back only to have Max ask for help and tell her someone has been shot. After the phone goes dead a second time, Joey and Penelope go to investigate, and while they don't find Max, they do find a dead body, which turns out to be another of the runway models from Siena's show. When the police arrive, they handcuff both Penelope and Joey until things can be sorted out, which doesn't go over well with Joey. After this incident, it causes a rift between them, and he too disappears, leaving Penelope alone in New York City - or at least until Arlena and her father can arrive to help find Max and clear his name. 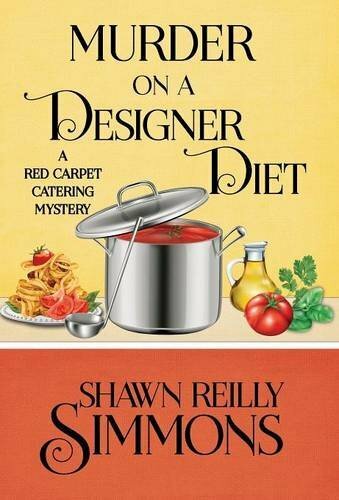 This is the third book in the Red Carpet Catering Mysteries, following Murder on a Silver Platter and Murder on the Half Shell. 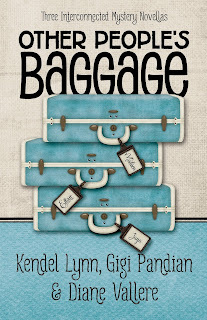 While I hesitate to give away any more of the plot than stated above in order not to spoil it for others, I will tell you that it can be read as a stand alone, and it also has less to do with Penelope's catering and is more is focused on the mystery. That being said, I found it just as enjoyable as the first two books, and as much a pleasure to read. The author has created characters that have a life of their own; they are not merely words on a page, with no inspiration. They are well-defined, believable and have personality. She has that rare quality of imagining the person she wants to see and the ability to put it into words. The result is a delightful ensemble of people who care about each other and are willing to go to great lengths due to their loyalty, affection, and belief in one another. 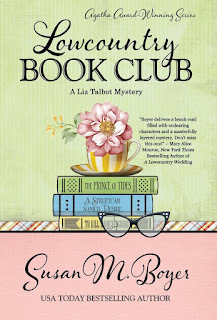 Ms. Simmons has given us a book imbued with a great mystery, a little romance, and enough suspense to keep us wanting more. There is no doubt her skills as a writer are once again proven in this latest mystery and I look forward to the next one in the series. Highly recommended. Baggage claim can be terminal when a computer glitch mislabels identical vintage suitcases. This is what happened after three women with a knack for solving mysteries each grabbed the wrong bag. MIDNIGHT ICE by Diane Vallere, A Mad for Mod Mystery Novella (prequel to Pillow Stalk). When interior decoration Madison Night crosses the country to distance herself from a recent breakup, she learns it's harder to escape her past than she thought, and diamonds are rarely a girl's best friend. SWITCH BACK by Kendel Lynn, an Elliott Lisbon Mystery Novella (prequel to Board Stiff). Ballantyne Foundation director Elliott Lisbon travels to Texas after inheriting an entire town, but when she learns the donor was murdered, she has to unlock the small town's big secrets or she'll never get out alive. FOOL'S GOLD by Gigi Pandian, a Jaya Jones Treasure Hunting Mystery (prequel to Artifact). When a world-famous chess set is stolen from a locked room during the Edinburgh Fringe Festival, historian Jaya Jones and her magician best friend must outwit actresses and alchemists to solve the baffling crime. As the title states, these are three interconnected mystery novellas. 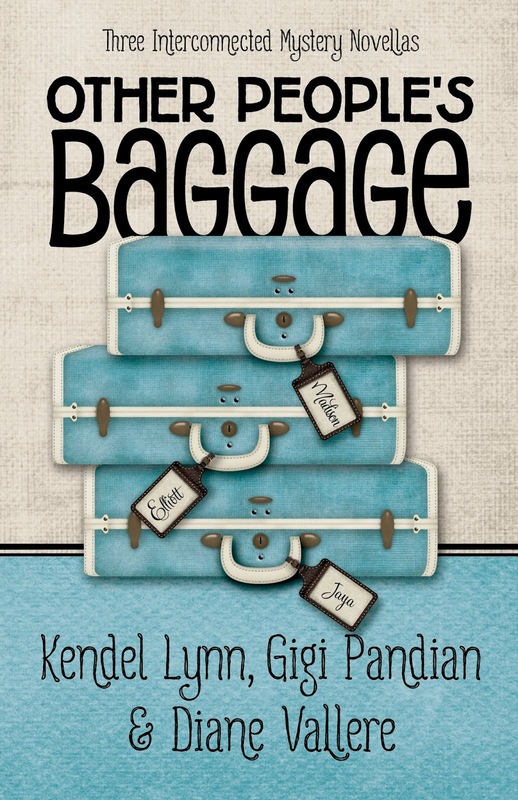 Three quite lively and fun, and the connection between them is only the transposed suitcases. But it is the perfect plot to begin with, and one that spawns three delightful stories of intrigue and deceit. I love the main characters, and have from their books, but even in these short tales we are given quite a nice package in each, and the secondary characters are given enough teeth that they are enjoyable to read. Since the stories are basically mini-books, I hesitate to give any more information on each, but take the time to read them. 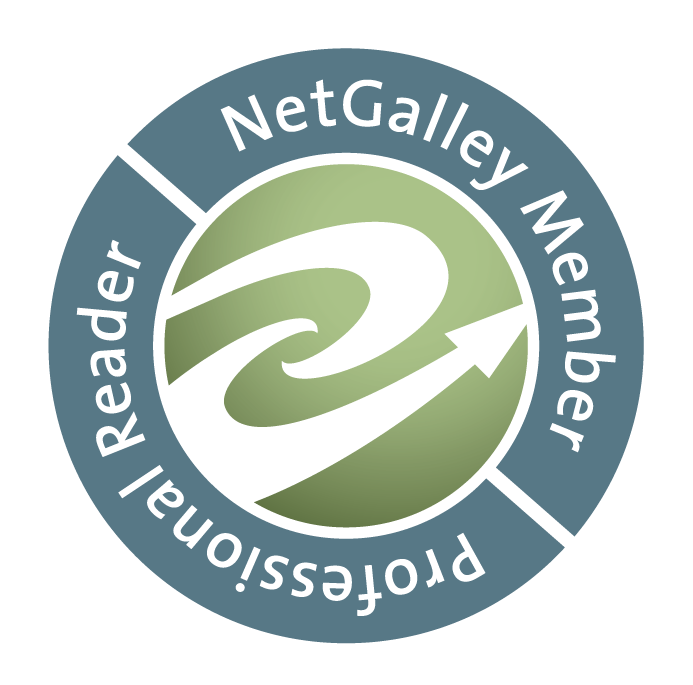 If you don't know these women from their books, this is a good place to begin, as they are all prequels to their series; and if you have already read their books, I am sure you will enjoy visiting with them again. Highly recommended. Somebody pushed Shelby Poinsett out her second-floor library window and it wasn't her husband. At least that's what Charleston's most prestigious law firm wants Liz Talbot to prove. Liz must run the spectrum of Southern society, from the local homeless shelter where Shelby volunteered to the one-hundred-year-old book club where Charleston's genteel ladies are dying to join, to bring a killer to justice. When Liz Talbot and her husband Nate Andrews are hired by Fraser Rutledge and Eli Radcliffe, Charleston attorneys, to find information that proves Clint Gerhardt innocent of the murder of his wife, Shelby Poinsett, they don't realize that this case could be more difficult than anything they've ever worked on before. It is due mainly to the fact that there are almost too many suspects - from Shelby's book club members, people she helped down at a shelter, and even Sonny Ravenel, a Charleston police detective who is her brother Blake's best friend. The problem lies in the fact that the investigating detectives seem to think Clint is the guilty one, due to the fact that Shelby and Clint were home alone at the time, and there is no indication of anyone else's presence. It doesn't help that the previous private investigator who worked on the case has suggested that Clint killed Shelby because her thought she was having an affair. There are authors who are very good at tossing around red herrings. But Ms. Boyer has the ability to open an entire tin of red herrings and, in offering up to her readers, dares us to find the truth before Liz does. In this, she excels. 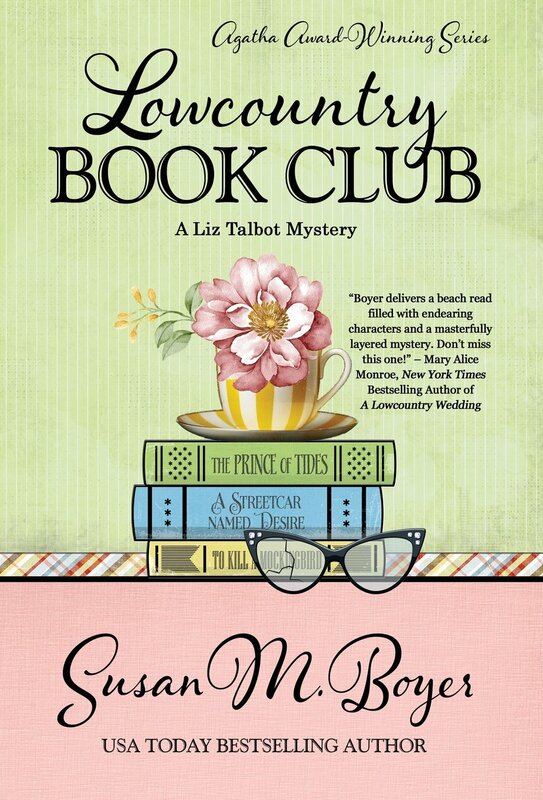 As with all of her books, I loved this latest in the Liz Talbot series. Liz is intelligent, strong, can take care of herself, loves her husband and family, and even manages to stay sane with Colleen popping up around her at inopportune moments. Nate, her new husband, has recently been introduced to Colleen, and although he's not as indifferent to her comings and goings, is just as smart as Liz and trusts her instincts as much as his own (even if they disagree at times). In turn, this leads to a good pairing of PIs who not only work together, but love each other. When we finally find out the identity of the true killer (for we know all along with Liz herself, that Clint couldn't have murdered his wife), it all seems such a waste, showing us how irrational even the most sane-appearing person can be; and it all comes together in a nice package, with all the ends tucked together. Once again, Ms. Boyer has given us a good mystery to savor, much like a warm plate of biscuits and gravy, and just like the biscuits, leaves us wanting more when all is said and done. Highly recommended. Giulia Driscoll's sister-in-law barges into Driscoll Investigations and promptly passes out from OD'ing on an unknown drug. Two OD'd teenagers are found dead in the park and behind a convenience store. DI's new client insists her missing twin sister is not dead and enlists Giulia as the "Missing Person Whisperer." Hooray for steady work? The missing sister's trail leads to married, pregnant, ex-nun Giulia's first experience with online dating sites, to the delight of her husband and employees. Those dates lead her to local Doomsday Preppers. They grow their own everything, and that everything may be connected to the drugs, her sister-in-law, and the missing twin. These Preppers are about to learn the true meaning of doom. 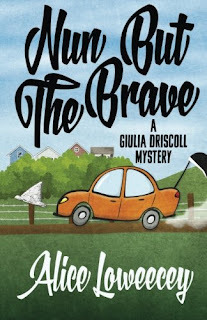 While Giulia expects this case to be merely routine - after all, how hard can it be to follow up on leads the police already have regarding a missing person? - she soon finds out that it's not going to be that easy. Aside from the fact that she needs to join dating sites posing as a prepper in order to find links to Joanne's disappearance, her brother seems to have gone over the deep end, her sister-in-law is in the hospital under the influence of an unknown drug, two young girls are found dead possibly OD'd from the same drug; and Giulia herself, in her disguise of Maria Martin, may have ingested some of that drug. This book, like all of Ms. Loweecey's, was an absolute delight to read. Giulia is no shrinking violet; she has guts, strength, integrity, and intelligence. She doesn't venture forth into situations unprepared; she keeps her gun and cell phone nearby, and is quick-witted enough to extricate herself from what could be sticky situations. She's a person that is full of life, and it shows through in her character, both in words and actions. When the book finally ends, and we find out the fate of Joanne and what happened to the girls, it is with a feeling of justice served when all is said and done. The ending is just as it should be, giving us a sense of satisfaction. The writing is brisk, the characters well-drawn, the plot interesting and riveting. Highly recommended.